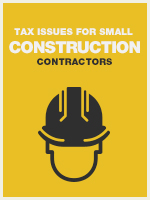 The construction industry presents a variety of tax complexities for preparers. Among the difficulties is the generally required use of the percentage of completion method of accounting for construction contracts and the application of the look-back interest rules. Fortunately, there are exemptions for some of these complexities for the smaller construction contractor.